G.H. Hardy said mathematics is a young man’s game and the world still believes him. This should therefore be Nathan Ellis’s time to shine. However, the young math whiz will always feel out of place in the world, even if he lands a spot on the UK International Mathematics Olympiad (IMO) team in Morgan Matthews’ A Brilliant Young Mind (trailer here), which opens this Friday in New York. Ellis is “on the spectrum” to use the film’s preferred term for autism. He has a savant like talent for recognizing patterns, but human relationships are almost beyond his grasp. His father Michael was the only one the lad ever opened up to. Unfortunately, he was killed well before his time in an auto accident (it kind of looks like it was his fault, if that mitigates the tragedy for you). Regardless, his grieving mother Julie is now stuck raising a temperamental son, who refuses to let her touch him. Despite the cold shoulder he is oblivious of, Julie Ellis devotes herself to Nathan and his math-based obsessive compulsions. She finally gets a break when Martin Humphreys agrees to tutor Ellis, with an eye towards the IMO. He too once competed at the Olympiad, but was undone by his self-sabotage and the onset of his MS. Somehow, Humphreys maybe gets through to Ellis just a little bit. There is also a burgeoning attraction between him and Julie Ellis, but he does not feel he can pursue it. Eventually, Ellis will join the other prospective UK team members to train in Taipei with other national teams. It is there that he will meet the charming young Zhang Mei from the Chinese team, who will get past even more of his defenses, much to his arrested adolescent confusion. A Brilliant Young Mind is inspired by Matthews’ IMO documentary Beautiful Young Minds, which explicitly invokes the Oscar winning A Beautiful Mind. Clearly, title originality was not a priority. Regardless, there is plenty of room for another film that takes maths (as they say in Britain) seriously. Yet, building a film around a confoundedly reserved character like Ellis is a challenge Matthews never fully licks. Asa Butterfield (a.k.a. Ender Wiggins, who arguably might be a tad on the spectrum himself) is actually quite convincing as Ellis, but it is mostly a one-note give-you-nothing performance. That’s a reality the film scrupulously observes, but it makes it feel wildly unbalanced, because everyone around him is so much more interesting. Jo Yang is wonderfully smart and sensitive as Zhang Mei, somehow developing chemistry with someone who hasn’t any of his own. However, Rafe Spall really lowers the emotional boom during the scenes in which he wrestles with the indignities of his progressively worsening condition. Sally Hawkins also makes you ache for Julie Ellis, to the point that you would forgive her for resorting to a murder-suicide pact. Eddie Marsan also does his thing as the slightly obnoxious, but rather shrewd UK coach. There are some truly fine performances in ABYM, but James Graham’s screenplay trots out way too many clichés. Let’s be honest, everyone is doing great if we can believe Zhang Mei is interested in Ellis. Adding another jealous UK team member is really pushing it, but it presents an easy way to advance the action. Still, the scenes in Taipei look great and take Ellis out of his comfort zone in a way that we can believe will be healthy for him. 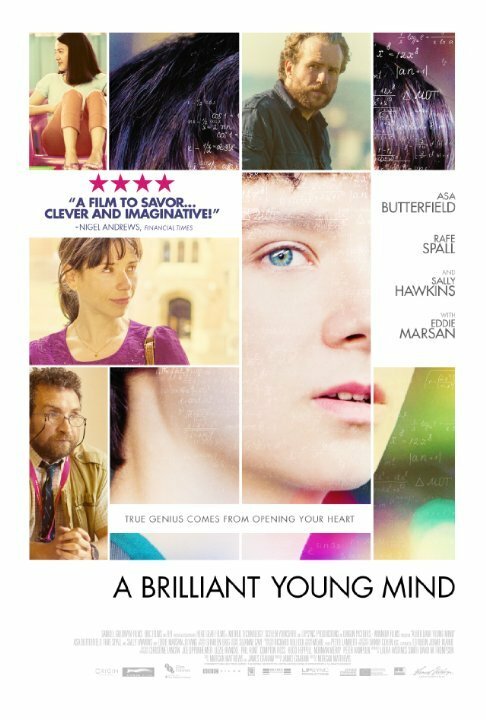 Mostly recommended for those who appreciate watching a cast of fine British character actors, A Brilliant Young Mind opens this Friday (9/11) in New York, at the Angelika Film Center.